"Sickness comes on horseback but departs on foot." 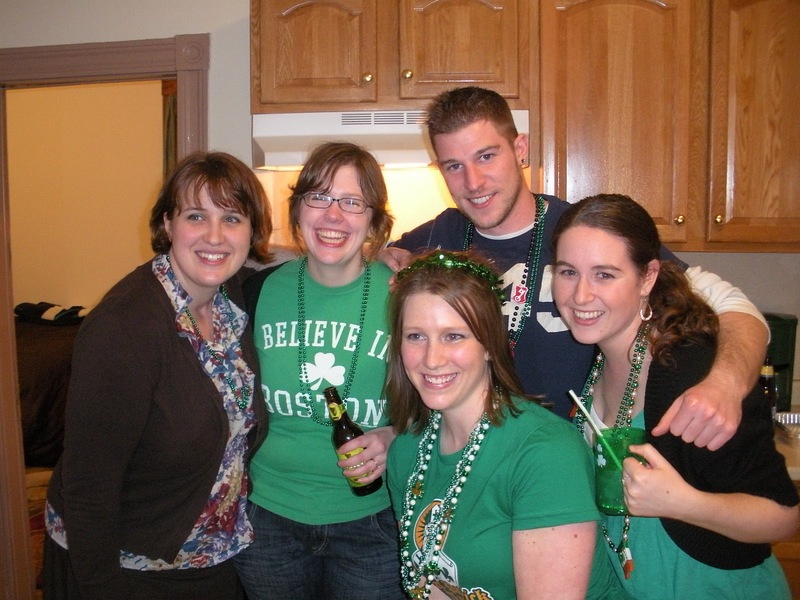 Last year on March 13, we had a great St. Pattie’s Day party, with the intention of going downtown the next morning for the parade. It was the first time most of our friends saw our apartment, and so many of our college friends came over. Even people who said they couldn’t make it were knocking on our door. It was our first time hosting a party as adults, but still kinda in college mode. So we went all out and bought cheese, chicken & sandwich platters. Most of the food was gone by the end of the night, so at least we tried to help, but we still all ended up feeling quite nice at the end of the night. When I woke up the next morning, I had a hangover, but not as intense as I thought it would be. I stumbled to the kitchen for water, and made a pot of coffee. I ended up in the living room in front of the TV. I double-fisted my water and coffee, and I was starting to feel better. Time for food. The thought of eating one of the left over sandwiches didn’t sound good. So I opted for a yogurt. I ate about half, and didn’t think it was sitting well, so I stopped. A little while later, off to the bathroom I ran. Back to the couch with my water. Drinking, drinking, drinking. And kept needing to run to the bathroom. I was in contact with my mother all day, and as I would start to feel better, I would try to eat. Nothing worked. When our friend woke up and was getting ready to leave, I was able to stay on the couch. I didn’t want him to think I was that hungover, since I’ve never vomited as part of a hangover. As the day went on, I knew that this was not a hangover. This was something else. Especially since I didn’t start vomiting until after I ate (which was quite a few hours after I woke up). I was in constant contact with my mother, and around 9PM when I was vomiting bile, and possibly blood, she asked me to go to the ER. I live less than two miles from a hospital and that is where my roommate brought me. I couldn’t even stand up to give the check in lady all my information. As soon as she had it, I asked where the bathroom was. I hung out in there until the nurse called my name to evaluate me. I was so weak at that point that it took all of my energy to hang over the toilet seat, and not lay down on the floor. I had my roommate come with me everywhere (she stayed right outside the bathroom), and was there as I was talking to the nurses. The nurse tested my BG, and I don’t remember what it was, but I do remember that it was high. *I had been testing my BGs all day. They were high, and I was taking insulin, and testing my ketones, but I didn’t have any all day until right before I went to the ER. I got admitted to the ER, and I got some fluids, some diet gingerale, and I immediately started feeling better. (That wasn’t saying much though.) I still felt awful, and around 2AM, my roommate went home. They wanted me in the ICU, but the only open bed was in the RICU, so there I went. 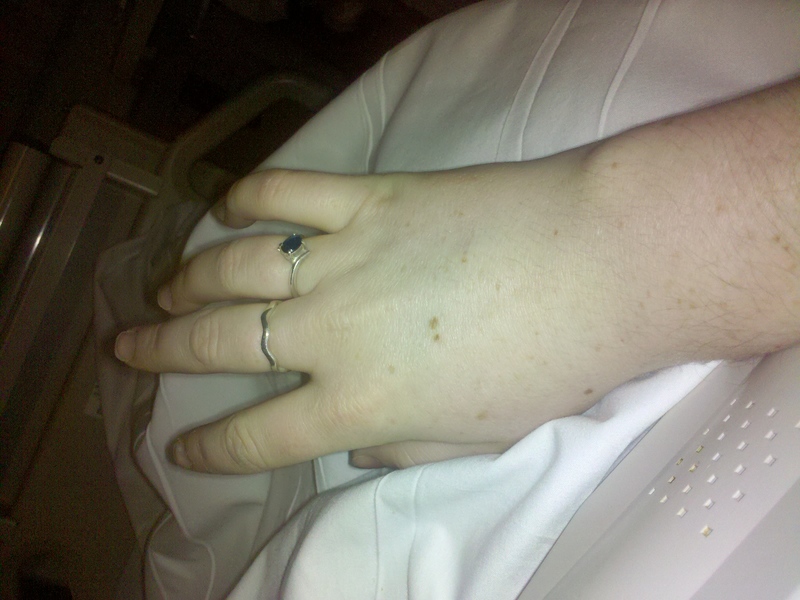 This was after I got x-rays (I think), and something else that required me to be wheeled out of the ER. I got to the RICU and my nurse was straight off the boat from Ireland. A big thick woman with the same type of accent. And just as nice. It’s funny how when you’re in your twenties and sick, everyone immediately treats you much younger, and I’m totally okay with that. I wanted my stuffed animal, and my mom, and sleep. I did get some sleep. When I woke up the next morning, an endocrinologist came to see me, and told me what my A1C was. In the event of full disclosure, here we go. 11.1% and DKA. No wonder why I was sick. My guess is that she’s a nice person if you fit exactly within how she views taking care of diabetes should happen, but clearly I wasn’t doing that. She asked me why I didn’t come in as soon as I tested positive for ketones. When I told her that I did, she didn’t like that I followed procedure and was still in the hospital. I was on an IV with Regular insulin (I believe). I slept a lot. My roommate called in sick from work (from lack of sleep), so she brought me clean clothes (underwear! ), my phone charger, a magazine and other various trinkets to survive an unknown length hospital stay. My parents were there with me pretty early in the morning, but I don’t know how long they stayed. I know that they stayed long enough to talk to the doctor. I’m not sure if they talked to the endocrinologist or not, but they did talk to the other doctor. I slept most of that Monday (March 15), and then had a hard time falling asleep that night. But finally it happened. And then the nurse tried to wake me up to have me take a potassium pill at 3AM. First of all, I can’t swallow pills (up until about a month ago). Second of all, if you’re going to make me swallow a pill, don’t wake me up to do it. My response: Can’t I just have a banana? I’m not sure if the nurse laughed or not, but I was pretty proud of myself for knowing that. Needless to say, I didn’t take the pill. But no one ever mentioned that on my chart. I was hooked up to all sorts of machines and wires, and completely uncomfortable. Besides not being able to test my own blood sugar, I was okay. I would call the nurses when I needed to use the bathroom. The other time I was concerned was after I noticed my hand was all sorts of puffy. Of course, I sent the picture to my best friend and mom before seeing if they thought I should ask the nurse. My arms both had IVs in them, so they thought the puffiness was from that. It was something they were keeping an eye on, but not something that was overly concerning. On Tuesday, I was restless. My father came to visit during the day, and it was good to see him, but I was completely embarrassed as well. I like unexpected visits with my parents; but the cause was not a reason I’m proud of. To prepare me to leave on Wednesday, I got a dose of Lantus at 3PM on Tuesday. My BGs went back up after that, but my body has never really accepted Lantus. The nurses were concerned, but I asked for Humalog and we were on our way. Of course, it took a lot of convincing to get the Humalog. No one ever said it, but the “you’re the patient, not the one with a medical degree” was being tossed around. Tuesday evening I buzzed the nurse because I was getting antsy. My awesome Irish nurse came back to see what was happening, and I asked if I could go for a walk. I’m not sure what being a nurse is like, but something I guess from her reaction is that ICU nurses aren’t used to people asking to go for a walk. And as we walked out towards the hallway, I could see why. All my neighbors were flat in their beds, some grunting. I’m a healthy, active person. I did not make it very far. I made it back to my bed, but I was exhausted. Wednesday was St. Patrick’s Day, and the day I was going to get to go home. My mom showed up around lunchtime, and was there for quite a while. On Wednesday I had a nurse I hadn’t seen yet. If they had met under different circumstances, my mom & her would be best friends. Sometimes people walk into your lives and make an impression. This nurse was mine. Her husband is a T1. I told her the story of how I got there, and there was no “you should have done this or that.” It was, wow, I’m so sorry. I hope you get better. Based on your charts, you’re already getting there. She was knowledgeable, but also admitted to not knowing it all since she’s an ICU nurse, not an endo nurse. At 3:15PM, I buzzed her. I’ve been watching the clock for hours knowing that they need to discharge me by 3PM so I can get back to my insulin schedule. I am freaking out at this point because I’m used to not being taken seriously by most of the nurses/doctors. In walks savior nurse, and after the coaching of my mother, I tell her straight-forward what has happened. At that instant, I was without any insulin because I got my lantus shot 24 hours ago, and I need another one, or I need to go back on my pump. This is not an exact quote, but pretty damn close: You’ve had diabetes for 20 years. You know better what you need than the doctors who don’t have time for you. Get back on your pump if that’s what you need. But can you wait 2 minutes so I can watch and tell my husband about it? Those two minutes didn’t hurt, and I set everything up. Savior nurse and another nurse came in and I explained all about the pump. The type of site I use and basals & boluses. I changed my site for them to see, I got dressed, and the doctor came to give me my discharge papers. I came home, took a real shower, and my roommate, mother and I went out to dinner. There was no alcohol; there was no big celebration; there were laughs and good food. There was a commitment to get better, work harder, and lower the A1C. It took me a long time, nearly all summer. But I’m here, and working harder than I have – possibly ever. oh no briley! i am so sorry that you had to go thru all of this. i had no idea. so glad things are going better this year! hugs! I had a somewhat similar experience about 8 years ago – and it was my wake-up call to really start taking care of myself. It caused me to start thinking about going on the pump and it also helped me find the D-OC. Thank you for sharing your story! !